The Publisher of popular news website, Sahara Reporters, Omoyele Sowore, has thrown his hat into Nigeria’s political ring. He is now gearing up to run in the country’s forthcoming presidential election in 2019. 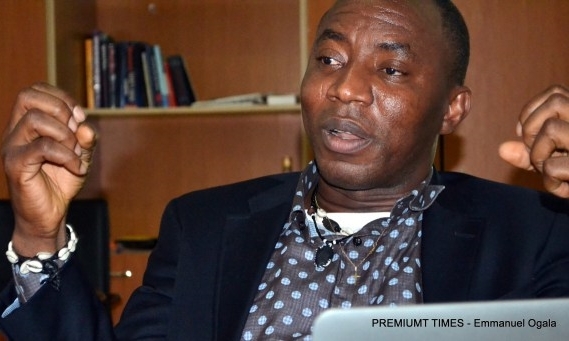 In this interview with PREMIUM Times' Editor-in-Chief, Musikilu Mojeed, Sowore explains why he is joining politics, how he will defeat President Muhammadu Buhari, how he will run Nigeria if elected and what he will do with Sahara Reporters once he becomes President. You have indicated you might run for president in the 2019 election. Why are you crossing into partisan politics? I’ve always been in the forefront of the agitation and struggle to move NIGERIA forward – first as a student and youth activist during military regimes. Since 1999, my focus has been on improving and sanitizing the democratic space. This is a natural progression of my commitment to moving Nigeria forward. This will not be politics as usual. I have always been a part of the movement to move Nigeria forward. I have always played a leading role in that movement. Are you not abandoning activism that way? Activism is simply advancing a pro-people agenda. For too long we have focused on using borrowed voices in the political realm while we’ve focused on creating awareness. That has failed. Since 1999 – the progressive movement has been disappointed by the actions and inactions of those we have left to handle the affairs of Nigeria while we reduced ourselves to election monitors, NGO leaders, and street protesters. Are you saying Buhari has failed and not worthy of being re-elected? Just a little over a week ago – over 100 young girls were taken by Boko Haram in Dapchi. Buhari’s appeal was supposed to be a tough stance against corruption and an ability to address the security crises posed by Boko Haram. No single major victory has been notched in the anti-corruption fight. Boko Haram is still alive and kicking. And the president’s inaction and lack of leadership is causing the herdsmen-farmers conflicts to take on an even more dangerous dimension. The Nigerian state is in shambles. Election is less than a year away. You are still holed up in your base in New York? When are you going to find a party, and then mobilise support for your candidacy? I think it is incontrovertible that in and out of Nigeria, I have been an effective contributor to the struggle for the advancement of good governance in Nigeria. The efforts to mobilize progressives and to form a coalition of progressive parties and organizations is underway. I am using my time in the U.S. to mobilize diaspora Nigerians. This weekend, for instance, I will be holding a town hall in Maryland with Nigerians. I am also spending a great deal of my time meeting with my strategy and policy teams – members of whom include some really accomplished Nigerians. Unknown to many I have been on the ground Nigeria in the last two months.The work goes on. I will certainly be spending more time on the ground in Nigeria. Prosecuting election in Nigeria is known to cost several billions of naira. Where will you find the resources for this project? Elections are always expensive – that’s true. However what is also true is that monies spent in Nigerian politics is not mainly focused on political mobilization or electioneering campaigns and organziation. As a political movement for true change, we will not be spending money on buying votes or distributing rice to the electorate. Our monetary needs will be greatly reduced. We will be sourcing funds directly from the Nigerian people. Nigerians have demonstrated a capacity to devote their resources to projects that they believe in. The recent team that represented Nigeria in bobsledding at the Winter Olympics raised almost $200,000 – a lot of it from Nigerians. We are already seeing and receiving commitments for support. Our approach will revolutionize the way politics is funded in Nigeria. There is also a lot of support that is coming in the form of goodwill donations. For instance – I’ll be in Maryland this weekend at a town hall. A group of concerned Nigerians are funding that event. We also have something that counts for a lot – an army of technology savvy supporters and media platforms that will amplify our voice to the Nigerian people. You are from the south of Nigeria. There are those saying you should wait till 2023 when Buhari or any other northerner would have completed the north’s turn of leadership rotation? What do you say to that? Where has our “Turn – by – Turn” politics gotten us? I’m a firm believer that when it comes to the life of a nation – all sentiments must be set aside and only the most capable hands should be employed to manage the affairs of Nigerians. If I believed in Buhari’s ability to lead NIGERIA, I would have supported him. When Jonathan – a Southerner like me was in office, I had a principled opposition to the way he was running Nigeria. It was Albert Einstein that said, “it is madness to keep doing the same thing and expecting a different outcome.” Nigeria has a unique opportunity in 2019 to elevate competence over tribalism, elevate character over dishonesty, principle over indecisiveness. I’m sure when the dust clears there will be candidates from across Nigeria expressing an interest in the presidency. Let Nigerians decide who should lead them. Recently Garba Shehu, a spokesperson to the President, said Buhari’s followership in Kano and across Nigeria is so huge and phenomenal that it has to be studied by political scientists. How can you defeat such a man in 2019? Buhari’s followership is large – but remember that it took four tries and an alliance with the South-West and with progressive democratic forces before he was able to become President. We are all witnesses to the unprecedented set of circumstances that saw an incumbent president defeated at the polls. If there is anything we have learned in the last few years, it is the fact that the Nigerian electorate has become impatient with purposeless leadership. My candidacy is generating significant interest across Nigeria, especially amongst the youth. The youth demographic is the largest single voting block. The coalition of progressives, youths and previously disenfranchised Nigerians that we are building will be a force to reckon with. I have been in the business of building movements since my time as a student activist in the late 80s and early 90s. I am confident that we will be able to build a broad coalition of Nigerians committed to taking their country back and setting it firmly on a path to prosperity and unprecedented progress. What will you do differently if elected president of Nigeria? Nigeria struggles because past presidents have had three major issues. Firstly, there is an abject absence of a clear vision as to where the country should be headed. Where should NIGERIA be in the next five, 10 or even 50 years? Where are the national plans that map out the country’s vision and the paths to their actualization aside from the propaganda we see on NTA? Today, we are impressed by China’s sustained growth, but since 1953 China has produced a series of 5-year plans that has guided their growth. Now they are on their 13th five-year plan (2016-2020). With that China became the most powerful and prosperous nation on earth using its populace as its best resource. China solved its housing crisis and even now boast of unoccupied apartments in “ghost cities” built in the last 10 years. China built one of the fastest rail services with an amount of money equivalent to the sums stolen during the oil imports scam. Same goes for the the UAE. Dubai was built into the architectural marvel that is now a magnet to NIGERIA’s thieving elites. I will be instituting a series of four-year plans to overlap with Nigeria’s political tenure system that will chart our path to growth and progress. Secondly, even where a clear vision might exist, nepotism, tribalism and favoritism has robbed us of the service of our best people. I am a completely detribalized Nigerian. My antecedents are that of an activist that has worked to build alliances and networks across this nation over the last 30 years. I understand first hand the value of having competent and capable people in the right positions. I’ve created a world-class media company in the last 12 years and taught in a private college for eight years helping to mould some of America’s greatest minds. You are a long-term activist and indeed a very popular figure across Nigeria. But Gani Fawehinmi was an activist who served Nigerians all his life. He made to be president in 2003 but the same people he served for almost his entire life abandoned him at the polls. Are you not worried you might get a similar treatment? Gani was, as you said, a household name across Nigeria. The reality was that in 2003, there was still some hope and expectation by the Nigerian people that the status quo political system would be able to lead NIGERIA to progress and growth. It is now clear that those largely naive aspirations were ill-founded. After numerous failed governments, Nigerians have demonstrated that they are ready to try new concepts and ideas and to go beyond the status quo in seeking solutions. That led them to pick a south-south Ijaw man as president in 2011 and in electing an opposition candidate who had failed to win the presidency three times before, in 2015. Gani came before his time. Also, there are other factors now present in our current political reality. For example, the power of social media helping young people to engage and interact, the power of technology to help change election outcomes, an accuracy of results, real-time reporting and capture of results. On the platform of which political party are you planning to run? That is something we are working on. We are currently in discussions with progressive groups and parties, the goal is to have a broad coalition of progressive parties that could lend their structures and ideologies to defeat the old order. When the time is right we will be announcing what party platforms that will be utilized. You have spent over 12 years of your life building SaharaReporters into a formidable news and anti-corruption platform? What becomes of the website now that you are crossing into partisan politics? Sahara Reporters will continue to speak truth to power. The platform is more than just Sowore. When I win the presidency, I will be turning over all of my assets to a blind trust that will run it. Sahara Reporters will continue to be run by independent-minded citizen activists. Even now, the website is managed by several others who have been groomed and schooled in the founding traditions of the website. That is what Sahara Reporters is and that is how it will remain. SaharaReporters is driven by its ever loyal readers and users! Thank you very much too for interviewing me.